The notes used for the presentation are posted on this website and should be read in conjunction with it. As I spoke we also displayed slides, of the Rosemount branch compared to some other OPL branches. The link to the slides is at the bottom of that report. I was accompanied to the presentation by nine READ members and supporting presentations were made by Megan Therrien of READ (and also representing Dalhousie Community Association) and Sophie Wong from the Connaught School Parents’ Association. I want to thank all those who participated for their support. It really helped emphasize that READ is widely representative. Councillor Jeff Leiper (Kitchissippi Ward) also attended the meeting to support us. Any comments from those who attended the meeting (and others) will be most welcome. You may leave a comment on the website OR send an email to readrosemount@gmail.com to the attention of Richard Van Loon. The Board was reasonably attentive to all three of our presentations as well as one from our own Deirdre Foucauld regarding the main branch. After my presentation there was a question from the floor about the abortive Tamarack negotiations and commentary from Councillor/Library Board Trustee Marianne Wilkinson about the feasibility of a levy. This followed the Board Chair’s comments that this was a route we should still consider. This is something neither I or Councillor Leiper have any enthusiasm for since no other branch renewal/expansion has ever required one. Later, in the general budget discussion, which was very brief, the Chair asserted that the Architecture49 report which I claimed not to have received had indeed been sent to us.This elicited an intervention from me and resulted in a certain amount of tension in the room. In fact the Chair was right. After a retransmission from Board’s staff I did find the original transmission in my files. I have apologized to the staff and the Chair for my mistake. The CEO did come over after the meeting which I much appreciated so we had a chance to clear the air and have agreed amicably that whatever happened is water under the bridge. Both she and the Chair convincingly reaffirmed their commitment to Rosemount after the meeting discussions. The CEO also confirmed that the $1 million in the 2017 budget amount is really a place holder pending more planning. 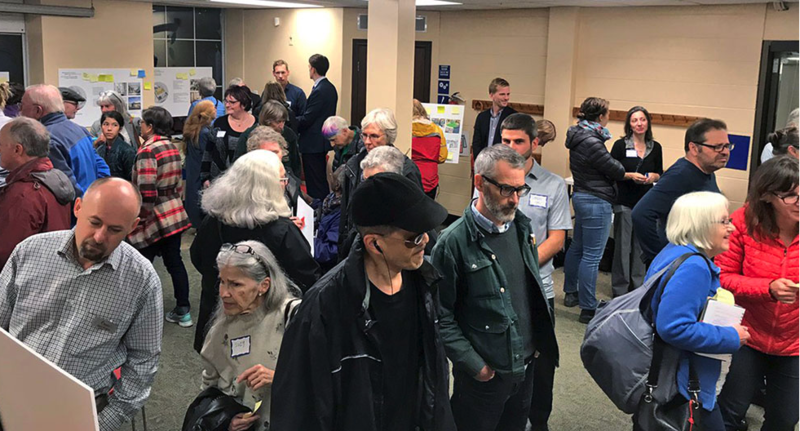 It is useful to note that the only item that actually elicited much discussion during the meeting was Rosemount so it is fair to say READ Rosemount is firmly on the Library Board’s radar. The Board will now have to commission a more detailed technical report on the condition of the building and its ability to accept upgrades/slight expansion. We will get that report. I don’t know when it will be done, however the planning timelines we asked for in my presentation seem OK. I do think, regretfully, that we need to accept that major expansion on that site will be unlikely. At our next meeting(s) we should spend time on two alternative scenarios: what we want if the current building is upgraded and what should be done if it can’t. This was also the CEO’s suggestion and we will forward whatever we come up with to her and the OPL Board. We should also concentrate on how we want to get wide and visible community involvement in further consultations. I hope the OPL board and staff will be receptive and we can assure this by keeping up the pressure we have begun to build.